Countless generations of European country living, have seen the rise and fall of myriad architectural styles and structures, with a range of construction materials also used to suit various climates and functions. 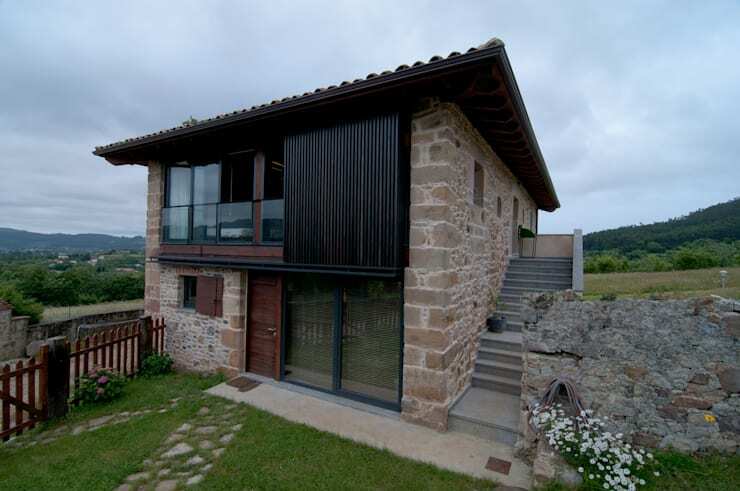 The strength of stone has long stood the test of time, as is evident in this beautiful home, with Spain's Rubio Bilbao Architects having taken a traditional, stone farmhouse and augmented it with a range of modern additions, elevating the home to meet the needs of a 21st century family. From the outset, this property presents a charming facade, with its rough, stone structure immediately catching the eye. Sections of glass and timber have been added, both inside and out, opening the home up to the elements and inviting light and air to circulate within. A glimpse of the living room reveals a lovely blend of modern and traditional styles, with the rough edge of the dwelling's stone walls softened by an array of casual, modern furnishings and warmed by a contemporary fireplace. The kitchen and bathroom also present pleasing and unique designs, with the former having been decorated in light timber and concrete, and the latter exuding depth and luxury, with its black and white finishes adding a sense of drama to the space. A lofty upper level houses the home's bedrooms, with a guest bedroom showcased here, in which two, single beds invite relaxation beneath an array of windows looking out onto the home's tranquil surrounds. The facade of this lovely home beautifully blends history and modernity, with its sturdy, stone walls having been augmented by a range of modern additions. Expansive windows border the home's more traditional wooden front door, allowing for an influx of natural light in warm weather, while the upper level has also been transformed, allowing it to open up to the elements and invite air and sun to circulate within. A simple, stone staircase leads up the right hand side of the home, providing secondary access to the upper level. Moving inside and we find a lovely living space defined by the classic finish of the home's rough, stone walls but populated with an array of stylish and comfortable modern furnishings. 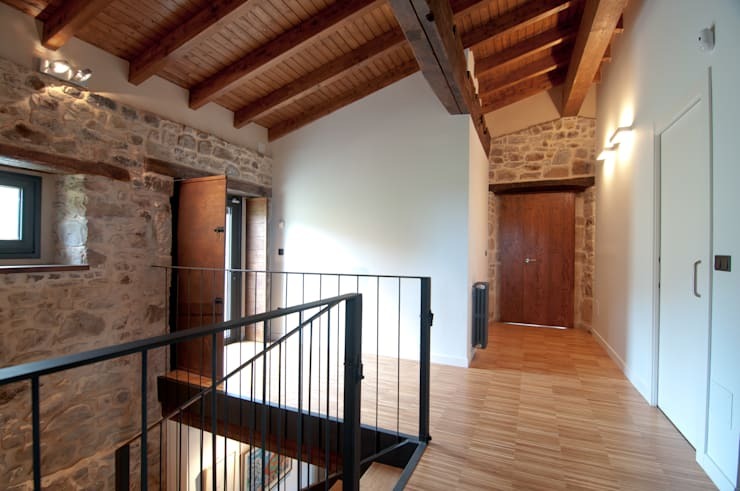 Strong, timber beams flow overhead, complementing the classic appeal of the stone structure, while the timber flooring emits a more modern finish. The furnishings throughout are understated, for a casual effect, while a fireplace has been included as an ode to traditional, country living, but with a cubist form for a contemporary edge. 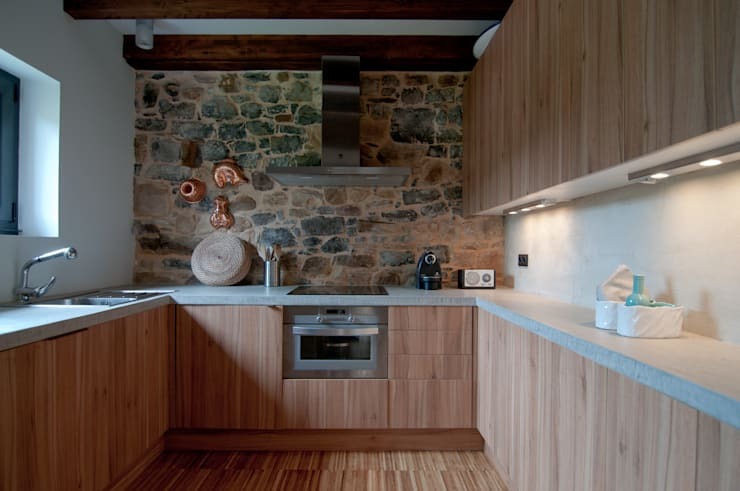 Moving through to the kitchen and we're met with a wonderful combination of rough stone, cool concrete and pale timber. The kitchen unit exudes modern style, with its beautifully constructed timber cabinets and drawers interspersed with a range of stainless steel appliances. Benches of cool, grey concrete flow across the cabinetry, adding an industrial edge to the room's aesthetic and presenting a modern variation of the home's traditional stone. 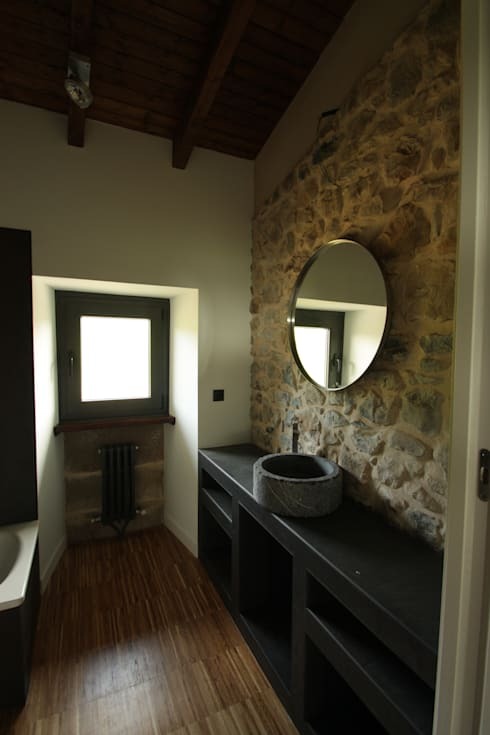 The bathroom presents another unique blend of tones and textures, with the home's stone walls interspersed with more modern, plaster sections. A bold, black vanity supports a stunning, stone sink, with its round form reflected in the circular mirror mounted above. A small window invites air and light within the space, while a contemporary, black and white bath tub stands ready to accommodate relaxation and indulgence. The upper level of the home appears open and light, with the space benefiting from a high roof and sections of white wall that help to amplify the illumination within. The deep tone of the timber ceiling and doors warm this level. The woodgrain is in keeping with the traditional atmosphere created by the home's stone structure, while sleek, black metal can be seen in the window frames and stairwell, adding a modern edge to the space. The upper level also houses this simple, tranquil space, perfect for use as a guest bedroom. 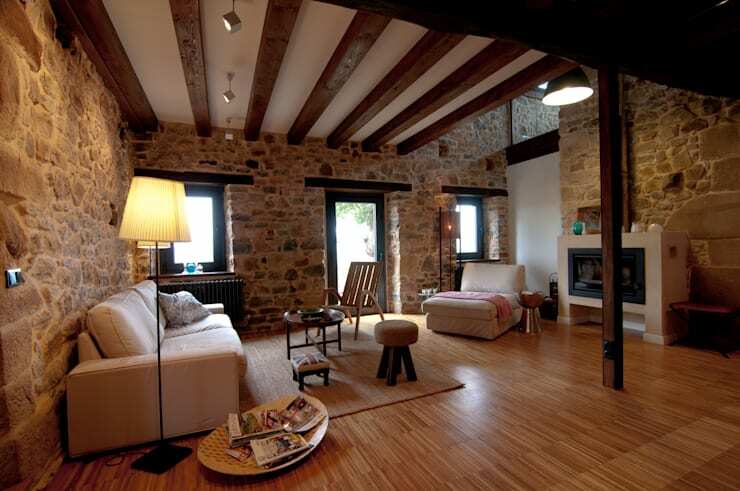 Framed by an array of windows atop a cool, stone wall, the room appears open, enticing and beautifully lit. Twin single beds rest head to head, with their understated tone matching the casual furnishings of the home's living area, and their clever construction housing a set of lengthy drawers for storage. 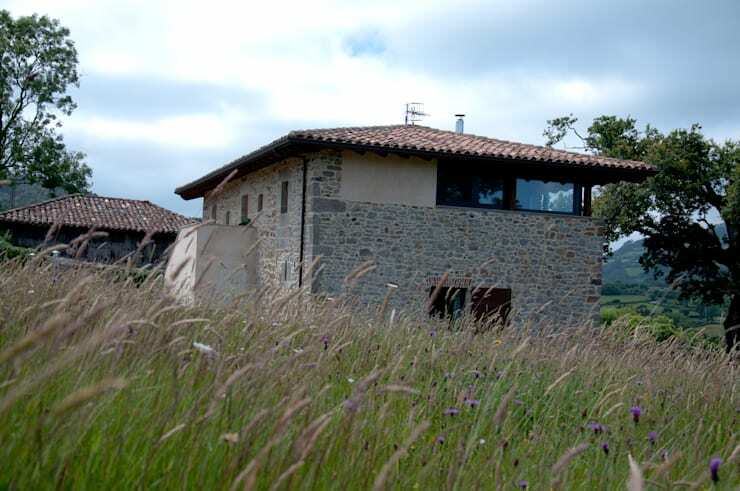 A view of the rear of this lovely home reveals the extent of its serene, rural surrounds. Resting simply amidst a grassy field, the abode presents a traditional construction that has been revamped to live up to the necessities of modern living. On the upper level we can see the sheen of the bedroom windows set into the home's ancient facade, a reminder that this dwelling continues to be reinvented, in order to stand the test of time for generations to come. If you enjoyed the blend of old and new prevalent throughout this lovely dwelling, then you'll be delighted by The Stone Home in the Mountains! Did you enjoy the interior decoration of this lovely home? How would you have decorated it differently?